Bereavement groups can help you deal with your loss. Losing a loved one is incredibly difficult, and moving on from the pain is often even harder. The grieving process does and should take time, and there is no set timetable for getting through it, but remember that your loved one would not want you to suffer endlessly. When the time is right for you, here are five tips to help you move on with your life. When a loved one passes over, you will likely find available support at every turn. After the first flurry though, people tend to get on with their own lives. 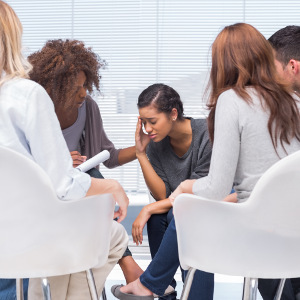 If you still need to talk about your loss, attending a bereavement group can pay dividends. Hospitals often offer these kinds of sessions, although you may prefer a one-to-one session with a trained therapist. It’s important to take care of yourself, both in the immediate aftermath of loss and in the following months and years. While it’s tempting to use alcohol or drugs to lessen the pain of grief, it is of more benefit that you focus on getting enough sleep and exercising regularly. It’s equally important to take care of your emotional health. Make time to see friends or perhaps join a class. You may feel like you are getting your life back on track, but grief can make an unwelcome return at any point. You are particularly likely to feel its effects on special days such as anniversaries and milestones. Plan ways you will deal with these emotional blows in advance and you may find them easier to cope with when they arrive. A small memorial service such as releasing lanterns may help mark the occasion. Your faith or spirituality is an immense source of support during difficult times. You may wish to speak to a clairvoyant psychic or a minister at your church. It’s natural for loss to test your beliefs, and these people can help you reaffirm your beliefs, find new peace in your life, and move forward in a positive way. If you don’t wish to talk to anyone, quiet meditation can also help. It’s likely that you’ll need to take care of some practical matters after your loved one dies. It might be that he or she took care of all the bills or managed children’s schedules. If these roles now become your responsibility, it’s important to get on top of them. Not doing so will only cause more stress; something you can definitely do without. These tips can help you move on with your life when you are facing a difficult time. To benefit from personalized tips, you may wish to chat to an authentic psychic online. Many people find these sessions useful when trying to move forward from the loss of a loved one, but it’s important to find what works for you and to take one day at a time.